Kyal Sauer, Jamie Cook, Rhyse Forrestal and Jannette Lovett. 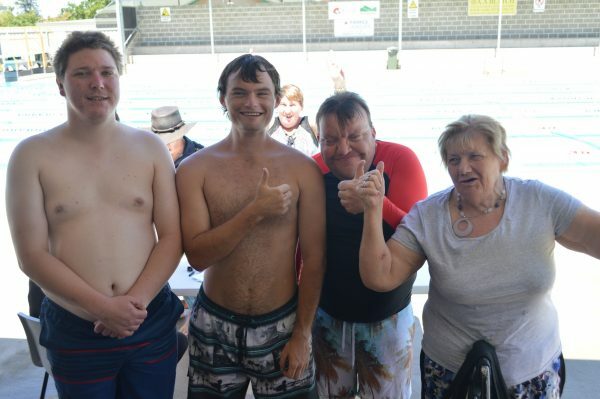 FOR the sixth time in seven years Currajong Disability Services have taken out overall honours in the Western Region Annual Swimming Carnival at Parkes Swimming Pool. A strong representation meant there were an impressive 105 nominations in total with entrants coming from as far afield as Temora and Cowra, who were the 2017 defending champions. Yet it was Currajong lead admirably by Ian “Thorpedo” Kaupke and Condo CDS representative Tim McDonald that dominated early with some impressive performances from Jamie Cook also. Chris Spicer, Jaime Porter, Tara Dennis and Jay Crouch also put in some strong performances while Kyal Sauer and Thomas Davis were also competitive. “CDS went very well and competed in the right spirit,” said Activity Co-ordinator and carnival organiser, Currajong’s Indigo Kriedemann. “Every competitor was a credit to themselves and their organisation. “Each year we see fantastic friendships and relationships develop and we were delighted to continue that with the other organisations and clients again this year,” said Indigo. The day also featured novelty events and a relay as well as a barbecue as a big turn out arrived for the carnival in what is one of the flagship events on the regional calendar. “Everyone had a go which is all you can ask, from competitors to volunteers,” said Indigo. “We can’t thank everyone enough.